For most of the past 35 seasons, the unofficial opening date of the Boston classical calendar was the Sunday after Labor Day. 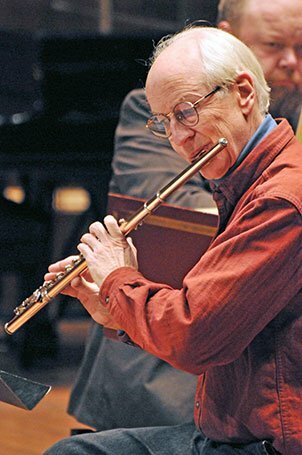 Invariably, it would feature flutist Fenwick Smith’s annual recital- always featuring unusual repertoire and an array of distinguished guest musicians. Fenwick contributed to just about everything in the Boston classical scene. His endless curiosity about new repertoire turned up on recitals and recordings, and he took up Baroque flute years before it was as fashionable as it is today. He was in Boston Musica Viva for 13 years, was a longtime member of The Boston Chamber Music Society (30 years), and played in the Mélisande Trio with violist Burton Fine and me for 15 years. He was a superb and honored teacher at NEC and at Tanglewood, and a member of the Boston Symphony Orchestra for 28 years as second flute. With Leone Buyse, he founded the Greater Boston Flute Association in 1992. Today it has 600 members. When not playing the flute, Fenwick worked for Powell Flutes, and plays a flute he made himself. He also built his own house near Tanglewood and created a state-of-the-art recording studio in a Roslindale Masonic Temple. There was little Fenwick did not do extremely well. This was also the 33rd annual flute Pappoutsakis competition winner’s concert. Pappoutsakis was a longtime BSO second flutist (first flute in Pops), a beloved colleague and teacher. The First Prize Winner this year, Thomas J. Wible, who has won a slew of second prizes and several first prizes, made a most favorable impression. 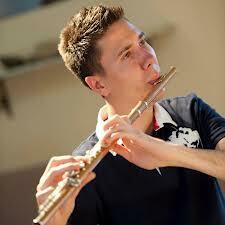 His tone is lovely, and he is not only an accomplished flutist but a musician who is interesting to hear. He doesn’t just play the flute, he makes music. And he doesn’t move around a lot, thank heavens. A very promising player. Pappoutsakis is quoted about auditions in the program book: “Tone is the first thing that anybody hears and appraises. I have been on many audition panels… and after a while the players all sound good… Then, all of a sudden, someone behind the screen will play and you will listen to someone whose tone quality is so sparkling, so alive, with such personality and you say, forget all the others.” This was the kind of impression Wible made in his first piece just before intermission (with the superb harpist Franziska Huhn), Serenade for Flute and Harp by NEC composer John Heiss, another close friend of Fenwick. The “Serenade” bears the name of a warhorse for this clichéd combination, Vincent Persichetti’s (1957) “Serenade No. 10 for Flute and Harp,” a big favorite in the 1980s. And sure enough, there were at least two unmistakable parodies of or homages to this earlier serenade. There are, as well, the famous first 6 ascending harp notes from the Pastorale of Debussy’s Trio for Flute, Viola, and Harp. Cleverer were the tones of the phone numbers of the composer and his daughter (thank you to Franziska Huhn for this tonal insight!). John Heiss and Fenwick Smith have been good friends for decades, and Heiss wrote this after Fenwick insisted he do so, as he said in gratitude. He wrote it after the death of his wife, and it is quite a lovely piece which got an excellent performance. After intermission, the concert was all Wible’s and he was impressive. My idea of a perfect Sunday afternoon does not generally include a flute recital, but Wible kept me interested in the music. There was Dialogue for Solo Flute by Peter Child (b. 1953) with yet another Debussy quote, this time from Syrinx. A 15-minute piece by Jean-Marie Leclaire (1697-1764), Sonata in E Minor for Flute and Continuo got a terrific performance by Wible and pianist Ayako Yoda. A hilarious 5-minute solo flute piece, The Great Train Race by Ian Clarke (b. 1962), featured all kind of train sounds got a sweetly virtuosic performance, followed by an excellent performance Suite for Flute and Piano, Op. 34 by Charles-Marie-Widor (1844- 1937). The audience, consisting of many, many flutists filling the bottom level of Jordan Hall, was extremely enthusiastic, cheering on a local “student” (he starts his MA at Longy in the fall) and competition winner. For an encore, the two played Jacques Ibert’s “Entr’acte,” which sounds better with harp. The festivities continued at a reception, where it was really nice seeing so many flutists come out to praise and support their own at such a classy event. They gave collegiality a good name. Thank you, Susan! You captured the spirit of this very special day perfectly. The flute community IS a very collegial one and Sunday was a long overdue reunion of many friends and colleagues to pay tribute to one of the very best among us. Hope to see you next September as our next Pappoutsakis winner has the unforgettable experience of performing in our beloved Jordan Hall!